Her mom might be eyeing the White House, but Chelsea Clinton‘s world just became all about the nursery! The former First Daughter and global activist, 34, and husband Marc Mezvinsky welcomed their first child, a daughter, on Friday, Sept. 26, she announced via Twitter. “Marc and I are full of love, awe and gratitude as we celebrate the birth of our daughter, Charlotte Clinton Mezvinsky,” Clinton writes. 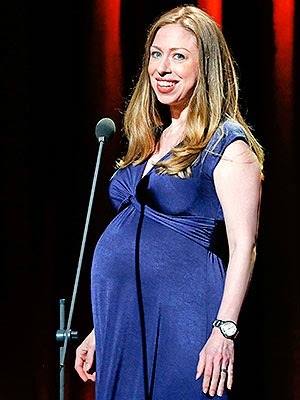 Months after announcing that she and Mezvinsky hoped to make 2014 the “Year of the Baby,” Chelsea, 34, confirmed in April that the couple were expecting. “I certainly feel all the better whether it’s a girl or a boy that she or he will grow up in world filled with so many strong female leaders,” she said, making the announcement at a Clinton Foundation event promoting the empowerment of girls and young women. It was the news the mom-to-be’s parents, Bill and Hillary Clinton, had long awaited and the former Secretary of State told PEOPLE in June that she was already preparing for the big arrival, stockpiling children’s books and planning to have a carseat in her own car. “I want to babysit any chance I get!” Secretary Clinton said. As for the new center of Chelsea’s and Mezvinsky’s world, Charlotte will be tucking into a nursery decorated in keeping with Mom’s passion for elephant conservation. “We’re very baby-oriented right now, so we’ll definitely be buying a felt elephant or two. I think those will look great in our nursery,” she told Refinery29 of her new gift line benefiting groups that combat elephant poaching.